In this article is a commonly confused words worksheet for early learners and one for more advanced learners. An explanation of commonly confused words is given at the beginning of the worksheet, and the answers are provided. Either worksheet could be used by teachers for either younger children or ESL students. If you students need more explanations of the differences between the most commonly confused words, check out the YourDictionary Battle of the Commonly Misspelled or Misused Words infographic for an easy-to-understand visual explanation. fewer - less = fewer means a smaller number, lesser is a smaller amount. Directions: Underline the correct word. (Who, Whom) is going to the party? I need to make (fewer, less) mistakes. I want to go, (two, to, too). Put the box over (their, there, they're). She (lead, led) the children in a song. (Can, May) I have another cookie? Give the present to (I, me). I need (your, you're) telephone number. The toy has lost (its, it's) batteries. The park is (by, buy, bye) the lake. I am going (two, to, too) the show. (Their, There, They're) going to be here soon. Are you talking to (I, me)? (Who, Whom) should I say is calling? I want to put (fewer, less) sugar in my tea. (Its, It's) time to go. (Your, You're) going to be late. I know you (can, may) do it all by yourself. That is made of (lead, led). We need to (by, buy, bye) some milk. The school (principal, principle) came in to the room. My pants are too (lose, loose). We went before the teen (council, counsel). The (capital, capitol) of Colorado is Denver. I like all (accept, except) the blue one. This is a (stationary, stationery) bike. I would like to (precede, proceed) with my story. It was a steep (descent, dissent) into the cave. Most drugs have side (affects, effects). Warm bread (compliments, complements) any meal. I practice so I won't (lose, loose) the game. The Senate was in session at the (capital, capitol) today. My daughter likes purple (stationary, stationery). The government's decision met with much (descent, dissent). Everybody likes to receive (compliments, complements). Voting can help (affect, effect) change. You should always stand by your (principals, principles). He will (council, counsel) me to help me make the right decision. She was happy to (accept, except) her award. A joke should (precede, proceed) your speech. Here are the answers to the worksheets - Levels 1 and 2. "Commonly Confused Words Worksheet." YourDictionary, n.d. Web. 24 April 2019. 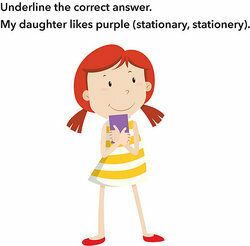 <https://education.yourdictionary.com/for-students-and-parents/commonly-confused-words-worksheet.html>.